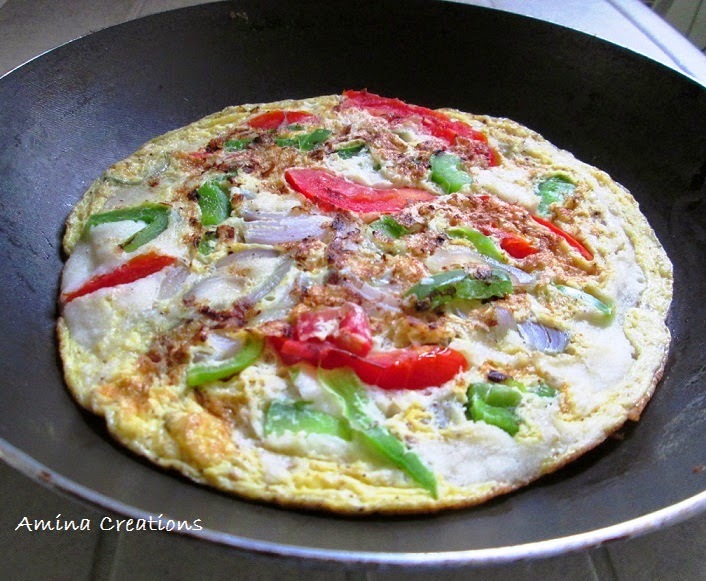 Today’s recipe is of a dosa laden with tomatoes, capsicums and eggs. It is healthy, delicious and is perfect dish to pack in your lunch box. You can also add grated cheese, cooked mushrooms and chicken, etc on top to make it more like a pizza and serve this piping hot with tomato ketchup. Whisk 1 egg, salt and red chilli powder (to taste) in a bowl and keep ready. Heat a non stick frying pan in low flame and spread a tsp of oil. Add ladle of dosa batter and spread evenly. Pour the egg mix and immediately add onions, tomatoes, and capsicums on top. Sprinkle chaat masala and close a lid. Cook in low flame for 2 to 3 minutes. Open and check if the dosa is cooked on the lower side. Turn it to the other side and cook for about 2 minutes. Once the eggs are cooked and the capsicums and tomatoes have turned slightly soft, turn over the dosa and serve. In the same way make the remaining 3 dosas.